Peace and Plastic: We Do! We Do! D-I-Y! This past Saturday night I acted as a spirited cheerleader while Mark changed out the kitchen faucet. Yeah, I know, it's an apartment, but fo' realz the old faucet just wasn't working out. 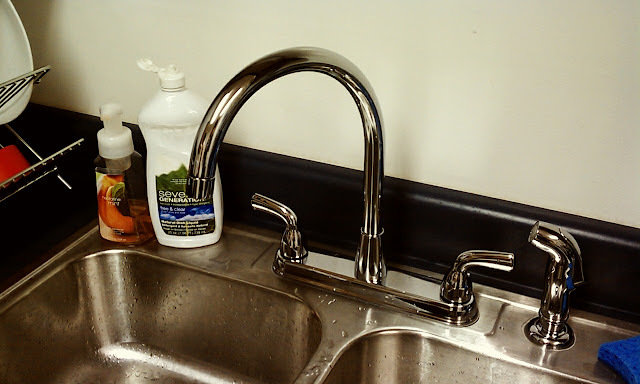 This picture just doesn't show the extreme failingness of this faucet. 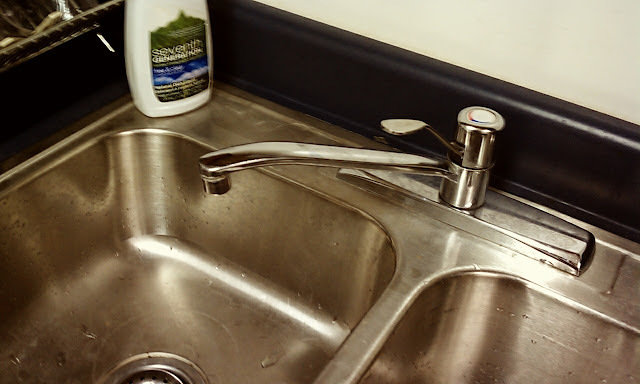 You see, the sink is pretty shallow as sinks go and the faucet pretty much just stuck straight out from the connection. When filling pots or water pitchers we would often have to get out a cereal bowl and fill and dump it in the larger vessel repeatedly. Doing the dishes, my least favorite chore (good thing Mark doesn't hate doing the dishes! ), was made worse with this faucet as a standard dinner plate could barely be washed! So we figured "Hey, we hope to live here for a while - so let's make it pleasant!" So while at Lowe's I busted one of the several 10% off coupons that you accumulate while moving and we picked out the tallest (and cheapest - hey, it's still an apartment) faucet we could find. So arrived this $68 beauty (less 10% of course). Music, wine and a new faucet. 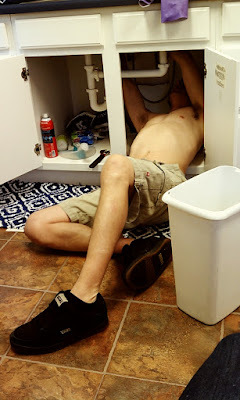 After an evening of soaking with penetrating oil, Mark climbed under the sink. There was only minor swearing while removing the old faucet - which was definitely the hardest part of the job. After the old one was removed, even I climbed under the sink to help install the new one. That is when Mark snapped this incredibly flattering picture. 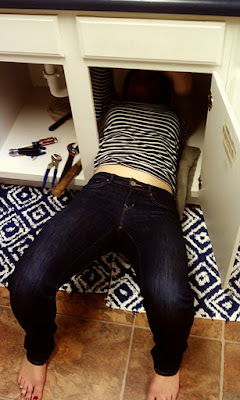 What you don't see in this picture is that there was a little residual penetrating oil inside of the cabinet which I laid my head in. It took several washes to remove the "awesome" scent from my hair. In the end it was a pretty simple project that has somewhat upgraded the kitchen. Unfortunately faucets can't fix crappy sinks and sad water pressure issues - but hey now I can just let my pot chill while it fills! 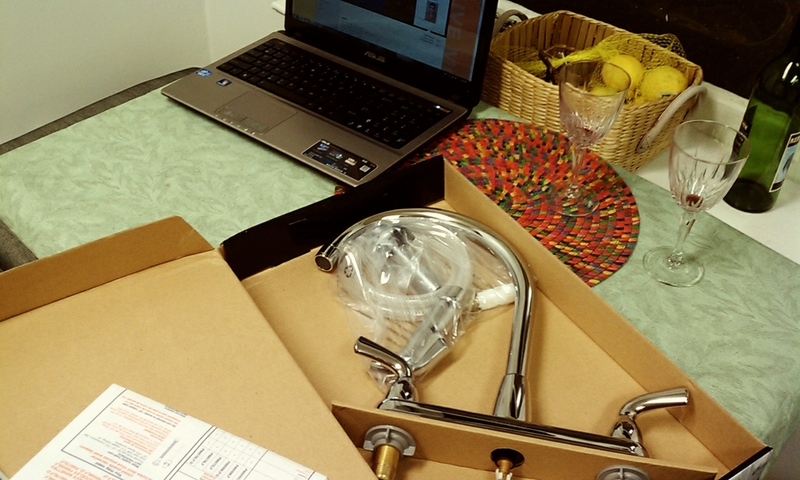 And of course Mark will have a much easier time doing all of our dishes! Aside from calling the faucet a "beauty", good job! I also like how you styled yourself to go with the kitchen floor mats!